"Exploratory Research on the Success Factors and Challenges of Smart City Projects"
was awarded "Best Paper" at APJIS Vol.24 No.2 !!! Social media describes the collection of web and mobile-based technologies that mediate human and social communication via social network. It enables individuals, groups and communities to gather, communicate and share information, to collaborate or to play. Social media research has become critical as the role of networks and other digital technologies become an anchor for change in societies as well as business domain. By facilitating access to user-generated contents, social media also has become a democratic, personalized, and do-it-yourself platform of communications as well as practical tools for business. Companies can sense crowd opinion on products on social media and are devising innovative methods to attain insights from user-generated contents for developing their competitive strategy. Furthermore, citizens share opinions and participate in the government policy development by using social media. "E-Smart Health Information Adoption Processes: Central versus Peripheral Route"
was awarded "Best Paper" at APJIS Vol.24 No.1 !!! 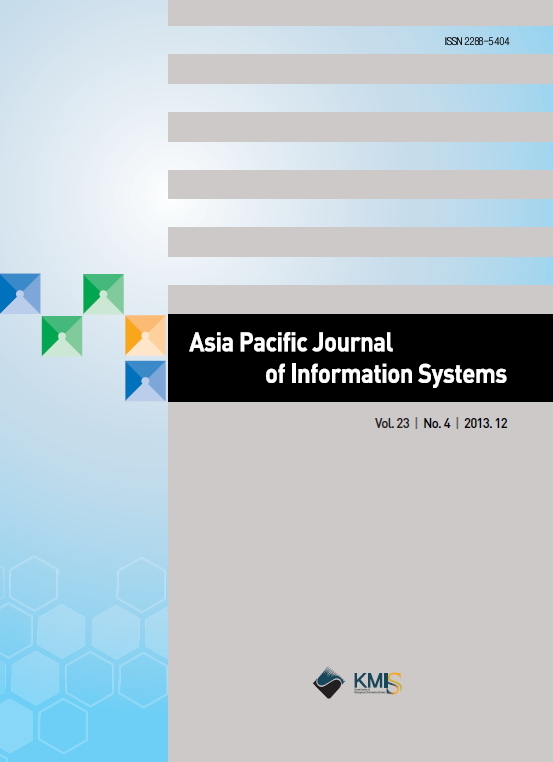 The Korea Society of Management Information Systems (KMIS) has been publishing the Asia Pacific Journal of Information Systems (APJIS) (ISSN: 2288-5404; e-ISSN: 2288-6818) since the year 1990 and has successfully made it a flagship journal in the information systems field in Korea. Full Peer Review: All manuscripts submitted to our journal undergo peer review. No Submission and Publication Fees: There is no fee for all English papers submitted to APJIS. Best Paper Award: For each issue, the editorials committee will select one outstanding paper and award prizes of $1000 with a certificate. Fast Review Cycle: The first review round will be completed within around one month. Please submit your papers to APJIS (apjis@kmis.or.kr). If you have any questions, please free to email me at isjnlee@korea.ac.kr. The best paper award is presented to a paper among all papers in each new issue of APJIS. The best paper should be written in English and make a significant contribution to IS research. The prize shall be KRW 1,000,000 (approximately US$1,000) per paper and a certificate. There is no submission fee for all papers submitted to APJIS. If the manuscript is written in English, no publication fee is required. If the manuscript is written in Korean, the following publication fee will be applied. KRW 100,000 for the first 10 pages. Additional KRW 10,000 per page will apply after page 10. APJIS has just rolled out its newly updated, more dynamic homepage. The new APJIS homepage has been designed not only to make it more user-friendly, but also to offer quicker access to a variety of articles and news. It features the lists of the most downloaded articles, the most cited articles, newsletters, special issues, etc. APJIS is continuing to spruce up the homepage. Your comments, emails and tweets of feedback on the updates are always welcome. APJIS September 2013 has been published. APJIS December 2012 has been published.